The flat lands beyond have been a part of aviation history since Glenn Curtiss founded the first military flying school in America on January 17, 1911. The Army operated Rockwell Field until January 31, 1939. 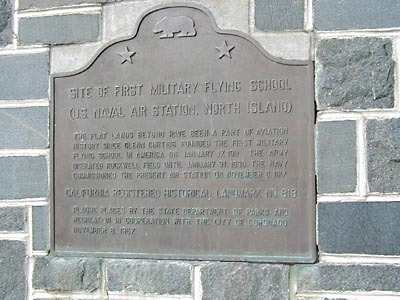 The Navy commissioned the present air station on November 8, 1917. Sunset Park, 200 block of Ocean Blvd, Entrance Gate 5, Naval Air Station N Island, Coronado.